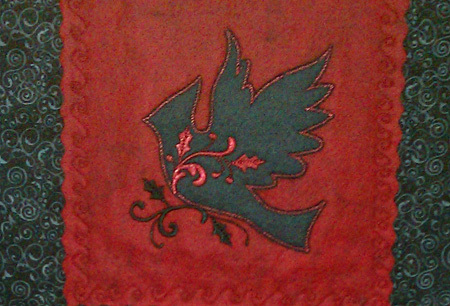 I teach the 8 Series and Embroidery Club at The Sewing Room in Beaverton, OR, and this wall hanging was done to show machine applique and promote the 2011 OESD Christmas Collection #1. In this picture it’s hanging on the side of a display case, so it it looks a little rippled. (It’s properly hung on the wall now.) 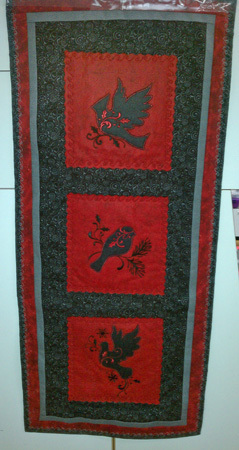 I appliqued black felt onto red felt squares (cut with a wavy rotary cutter blade), which where then appliqued on the background fabric. Hope you have a wonderful holiday season!